Purkle#1 is an Indica dominant strain created with a cross between Purple Urkle and Skunk#1, Purple Urkle weed is rightly regarded as a connoisseur’s choice because of its complex flavor which includes notes of grapes, berries and citrus. The weed has a sweetish, skunky smell (skunk#1) with hints of incense. This is a notoriously strong weed which delivers a powerfully narcotic high and couchlock. Inexperienced smokers should treat it with respect. Great for nausea, insomnia and lack of appetite. The plant grows quite tall, as high as 150 centimetres, and it starts out with a bright green colour which changes to a strong purple as it matures. 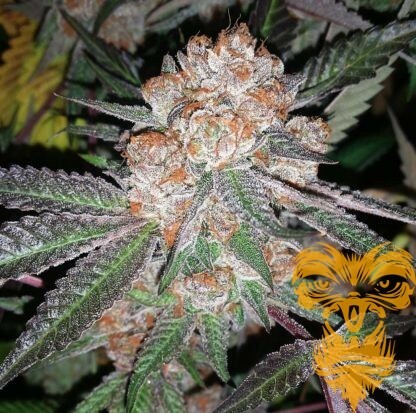 The dense buds are medium-sized with blue and purple tones and a covering of silvery crystals and orange hairs. THC content is around 18 percent. Purkle#1 seeds thrive in indoor growing set-ups whether cultivated in hydro or soil. 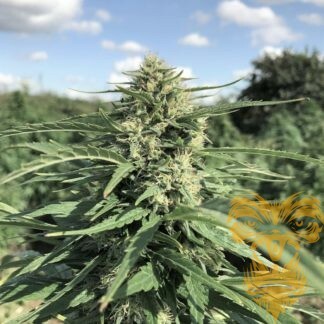 The plants produce stout branches laden with buds and they can be successfully trained using the SCROG method. This weed benefits from regular feeding. Flowering time is about eight weeks and grown with care it can produce up to 500 grams per square metre. You can grow it outdoors if you live somewhere with warm sunny summers and harvest will come in mid-end-October. If you like a smoke with a subtle, fruity flavor, you’ll enjoy Purkle#1. It also packs a potent hit and it’s a popular strain for medicinal use.